April 26 is National Pretzel Day. Crunchy and soft pretzels were known for centuries and were involved in different ceremonies. There are several theories about invention of the first pretzel. One of them says that pretzels were created in 610 AD in Italian monastery. 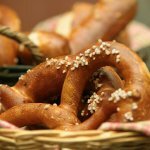 One monk made pretzels as a reward to children, who learned their prayers. He called the strips of baked dough “pretiola”, that meant “little rewards”. The first pretzels were folded to resemble arms crossing the chest, and its form was very important for pretzels. Soft pretzels were used during the wedding ceremony across Europe in the 17th century. A couple would make a wish upon a pretzel, break it and eat it to signify their oneness. This tradition became the basis of the term “tying the knot”, that originated in 1614 during a wedding between two prominent families in Switzerland. Crunchy pretzels were invented in Pennsylvania. One baker forgot a batch of pretzels in the oven. He was about to throw away over-baked treats but tried one. He was surprised with the pleasant crunchy taste of pretzel. Pretzels were an important part of economical Pennsylvania's history, that is why Governor Ed Render declared April 26 as National Pretzel Day in 2003. Whether you live in Pennsylvania or not, you should take a bag of crunchy pretzels to celebrate this holiday.